A pensioner from Kent has handed in a 10,000-signature petition to No 10 Downing Street calling for free rail travel for the over-60s. Harry Farrow, 64, from Kemsley, has also written over 400 letters seeking support in his 14-month campaign to win the train fare concession. 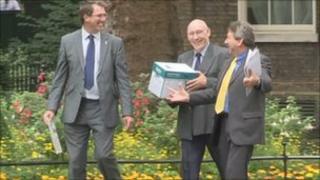 His MP, Gordon Henderson, and Kent county councillor Mike Whiting went with him to hand in the petition. Mr Whiting said local councils would need government funding for free fares. Mr Farrow paid for his campaign by selling his collection of toy soldiers, which fetched over £1,000. He said bus journeys, which were free for pensioners, were "no comparison" to the speed of train travel. "I went from Sittingbourne, near where I live, to Bromley South by bus and it took about four hours," he said. "Sittingbourne to Bromley South on a slow train takes 40 minutes." Mr Henderson, Conservative MP for Sittingbourne and Sheppey, said: "The wealth of this country was built on the hard work of pensioners. "I am a great believer that in a civilised society we should always look after our elderly."